FAQs - Grace Ridge Retirement Community - Morganton, N.C.
As you start to plan life’s next chapter and evaluate retirement community options, you’ll undoubtedly have questions. We’ve answered many of them below to help with your decision. Still have questions? A member of our marketing team is happy to help. Call 828-580-8330, complete our Contact Us form, or send an email to info@GraceRidge.org. Who owns and operates Grace Ridge? Grace Ridge is a nonprofit Life Plan Community or Continuing Care Retirement Community (CCRC) owned and operated by Grace Life Care Inc., an affiliate of Carolinas HealthCare System Blue Ridge. We’re one of two retirement communities in NC that’s affiliated with a health care system. Are all retirement communities the same? Absolutely not. Retirement communities differ in many ways, including amenities, contracts, agreements, refunds and overall ambiance. North Carolina offers basic types of agreements: Life Care, Modified, Fee-for-Service and Equity-Based. When comparing communities, make sure you compare similar types of agreements. Also, each senior living community has its own special personality based on location, residents and programs offered. We suggest you spend one or more nights at a community to see if it feels right for you. What’s a Life Care contract? With its mountain backdrop and active senior lifestyle, residences at Grace Ridge represent a sound investment. However, the real benefit of your real estate contract is insurance. In fact, all North Carolina retirement communities are overseen by the North Carolina Department of Insurance. As part of your Life Care contract, you would receive lifetime rights to live at Grace Ridge, even if you can no longer live independently, have health issues or need financial assistance. This reassurance is invaluable when planning for life’s unforeseen circumstances and ensuring the health of yourself or a loved one. What are the benefits of a Life Care contract? Benefits of the Life Care concept are best illustrated when a resident requires assistance. Should your health and wellness needs change, your entrance fee assures that you’ll receive high-quality supportive services and care in a professionally staffed environment. More importantly, you’ll receive this level of care for essentially the same cost as living in your residence. This means you can protect your assets from the potentially catastrophic costs of assisted living, nursing care or memory care. You’ll also be better able to predict monthly living expenses due to only a minimal increase in your Life Care monthly service fees – even when you require extensive health care. In addition to assured residency, your entrance fee allows use of all common facilities, services, programs and amenities at Grace Ridge. Is Grace Ridge associated with any national or state professional associations? Grace Ridge is a member of LeadingAge of NC, a state chapter of the national LeadingAge Association. A union of 5,400 nonprofit organizations, LeadingAge is dedicated to expanding opportunities and possibilities for the aging population. Through its affiliation with LeadingAge, Grace Ridge is committed to inspiring, serving and advocating for seniors. Learn more about LeadingAge. 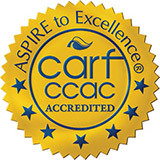 Grace Ridge Retirement Community earned accreditation from the Commission on Accreditation of Rehabilitation Facilities (CARF) and Continuing Care Accreditation Commission (CCAC), the only accrediting organizations for retirement communities. Only 18 senior living communities in North Carolina have been accredited by CARF-CCAC. Is Grace Ridge affiliated with a religious organization? Grace Ridge isn’t affiliated with a specific religion and welcomes people of all faiths and beliefs. We invite you to attend one of our nondenominational worship services in an idyllic setting that inspires spiritual connections. Who can live at Grace Ridge? As with many retirement communities, there are a few qualifications for residency at Grace Ridge, including age, assets, income and health. All prospective residents must be at least 60 years old and be able to live safely in an independent setting. Financial requirements vary according to age, health at the time of entry and residence selection. What services are offered beyond independent retirement living? While residents of Grace Ridge initially enter as independent living, we offer a full continuum of health and wellness in case your care needs change. Assisted living, skilled nursing and memory support care services are provided in the same building as apartments, ensuring the care you need is always nearby. What other cities is Morganton close to? Grace Ridge is ideally located in Burke County in western North Carolina. We’re only an hour’s drive from Charlotte and Asheville – both of which have airports – as well as Boone and Statesville. An added bonus? The Blue Ridge Parkway, one of the most famous U.S. highways, winds its way through the northwestern part of Burke County. Is it easy to make friends at Grace Ridge? One of the best parts about living in an intimate community with just over 200 residents, whether you’re married, single or widowed, it’s easy to fit right in with our friendly community. Do I need a golf cart to navigate the campus? No. It’s easy to get around Grace Ridge’s 52-acre community. Everything you want and need is conveniently offered under one roof. What kinds of amenities and common areas do you have? I love live sports and theatre. Can I get my share of both? You sure can! A one-hour drive gets you to Charlotte, where you can watch Charlotte Knights baseball, Charlotte Checkers hockey, Carolina Panthers football and Charlotte Hornets basketball. Closer to Morganton are the Hickory Crawdads and Asheville Tourists baseball teams. Meanwhile, CoMMA (City of Morganton Municipal Auditorium) offers year-round Broadway shows, concerts and theatrical productions. What features do your apartments and cottages include? Are there any improvements or renovations planned? With so many people discovering that Grace Ridge is an ideal retirement destination, we’re renovating and expanding our facilities each year. We’re currently investing millions of dollars in upgrades and culture enhancements, including a new café and lounge with outdoor seating and mountain views and more user-friendly areas for art, meetings and sports viewing. And don’t worry, our crews make every effort to minimize disruptions so you can live without interruptions to your services. Can I furnish and decorate my apartment? Certainly! We expect residents to furnish and decorate their apartments and cottages to reflect their own personal tastes. Grace Ridge also offers comprehensive finish options so you can customize your residence, and we’re delighted to work with you as you plan your décor. Structural changes or additions beyond standard features are also possible; however, these must be approved by Grace Ridge management and are the financial responsibility of the resident. May I bring my pet(s)? Grace Ridge is pet-friendly and we welcome your four-legged family members. However, there are certain areas where pets are not permitted so residents who have allergies or who aren’t animal enthusiasts can have their personal space as well. How much are resident entrance fees? Because our contracts and residences vary, entrance fees and monthly fees also vary; however, most entrance fees are easily covered by revenue received from selling your home before moving to a retirement community. Likewise, monthly fees are generally less than typical fees for food, utilities, health care and activities. What’s included in the monthly service fee? Do you have a health and wellness program? Indeed, and it’s included in your monthly service fee. Our program caters to all components for healthy senior living offering on-site classes and lectures through Grace Ridge University and classes (at little or no cost to you) at Western Piedmont Community College, less than five miles away. We provide on-site fitness and membership to Phifer Wellness Center with an indoor pool, membership to Mimosa Hills Golf Club, and a wealth of opportunities for indoor and outdoor recreation. Finally, we concentrate on your emotional, social and spiritual wellbeing. Whatever puts you in a good mood, from gardening and volunteering to fitness and games, you’ll find it at Grace Ridge. Is the monthly service fee fixed or subject to change? Monthly service fees are subject to change and reviewed annually by Grace Ridge’s Board of Directors and management. In most cases, fees are adjusted to cover actual operating costs. However, Grace Ridge strives to maintain low fees consistent with sound financial practices. Historically, annual increases approximate the annual cost of living and medical expenses, which affect the population of the area. If monthly fees increase, residents receive a 60-day written notice in advance. Are entrance and monthly fees tax-deductible? Since the IRS considers that you are “prepaying” part of your future health care cost by acquiring a Life Care or Modified Agreement, you can deduct portions of your entrance fee and monthly fee as medical expenses. Please see IRS form 502 and your tax professional for details. If I leave the community, does Grace Ridge offer entrance fee refunds? Yes. Grace Ridge offers 90 percent refundable entrance fees for both Life Care and Modified contracts. However, residents over age 80 are ineligible for refundable fees. Do you have an emergency response system and on-site security? We wouldn’t expect residents to live without it! Residences are designed for comfortable, distinctive living with careful consideration given to security, safety and accessibility. These features aren’t always noticeable in day-to-day living, but they’ll give you additional peace of mind. Every Grace Ridge resident has access to our emergency response system at any time. By request, we can also offer a manual daily check-in for apartment residents and phone check-in service for cottage residents. What if I need assistance but don’t want to leave my apartment or cottage? In addition to assisted living, Grace Ridge offers Enhanced Care, which provides in-home assistance within apartments and cottages. In-home services may include delivered meals, bathing and dressing assistance, medication and medical treatment, and routine monitoring of temperature, blood pressure, pulse and blood sugar levels. Typically provided by a certified caregiver, these services incur an additional charge depending on the amount of assistance needed. Are other kinds of services available? Our concierge program helps eliminate day-to-day worries and other stressful responsibilities so you can focus on enjoying retirement. Services are divided into six primary offerings to help you manage your daily schedules, activities and tasks: personal, home, shopping and errands, entertainment and leisure, travel and technical. Our professionals will perform the service themselves or safely and efficiently outsource the job. How does Grace Ridge determine when I should move to assisted living or skilled nursing care? The decision to ask a resident to move to another, more safe level of care follows a long, thoughtful process. Grace Ridge encourages residents to age in place, but sometimes, resident safety requires us to consider other levels of care. These decisions and discussions are based on mental and physical health and made in consultation with our Medical Director, Director of Health Services and our Executive Director using professional assessment criteria. In addition, we consult with the resident, his or her family and personal physician to make sure everyone takes part in the decision. In the event of a health care status change, will I have to give up my home? Often, when residents need care at Grace Ridge Health Care Center, the stay is only temporary so there is no need to give up a residence. In fact, we design our move and transfer policies to enable residents to remain in their apartments and cottages as long as possible, while still assuring the safety and wellbeing of the resident and community. In the event of a need for hospitalization, most residents use nearby Carolinas HealthCare System Blue Ridge Morganton hospital for these services. Yes, Grace Ridge’s Residents’ Association plays an active, integral role in community planning and interacts with our leadership team on many facets of campus life. Resident committees include decorating, planning and events, spiritual life, scholarship, library, landscaping, safety, fund development and welcoming committees. The association meets monthly and officers are elected annually. How do I become a Grace Ridge resident? It takes just four easy steps to become a resident and start living the active retirement life you always imagined. Choose your preferred residence, complete your residency application, and make a refundable $1,000 reservation deposit. Wait approximately 30 days for your application to be reviewed and approved. Following approval, submit the Residences and Services Agreement with a 10-percent deposit (less your $1,000 deposit). Plan your move so when your residence is ready (typically within 60 days from the time your 10-percent deposit is received), you’ll be ready to move in and pay the remaining 90 percent of your entrance fee. To schedule a visit with a member of our marketing team, call 828-580-8330, complete our Contact Us form, or send an email to info@GraceRidge.org.